French knitting, also called spool knitting or corking, is a knitting style that consists of weaving yarn into a narrow tube. There are numerous bag, craft or clothing patterns available that use French knitting. Spool knitting used to be popular in the 1970s. Since the year 2000, French knitting is making a comeback with celebrities like Julia Roberts or Britney Spear as models. French knitting is very popular with beginners because it is easy to do, simple and attractive. It is perfect for crafts, and children love to spool for hours on end to create ornaments, rugs or even socks. Grab your spool. A spool looks like a tube with four to eight pegs at the top around the rim. You can buy a spool knitter for about $10 at Hobby Lobby, Walmart, Michaels or JoAnn. You can also easily make your own with pins and a toilet paper roll. Knit a cord. You can change the color of the wool along the way to make interesting patterns. Put the end of a wool thread down inside the tube. Wind the thread twice around one peg. 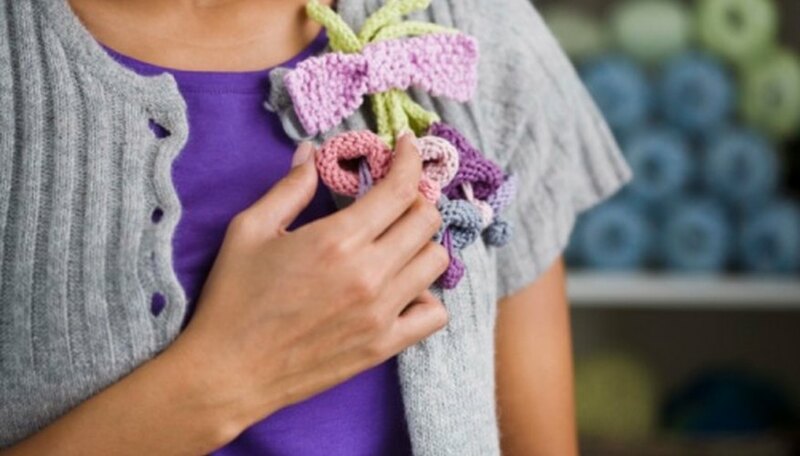 With a crochet hook, grab the bottom loop and pass it over the top loop. Work from the outside of the tube towards the center. You should now have a knot. Wind your yarn around the next peg counter-clockwise. Do the same with the next peg until you go around all the pegs. Use a crochet hook or your fingers to lift up and over the bottom loop over the top loop, into the middle of the tube. Do the same with all the remaining pegs, then start winding again. When you are done, cut the yarn a few inches away from the spool. Drop off the single loops over each peg towards the center. Take the dangling yarn and pass it inside each loop and tighten. Make a knot to secure the cord. Making a hot pad, is an easy pattern for all children and something they can offer their parents as gifts. Make the cord as long as 40 inches or less. Coil the long cord in the shape of a spiral, and sew all the neighboring loops together. Make a pin cushion. Buy a small box of any shape or recycle a lid. Do a test in order to make sure the cord fits inside the box. Roll the knitted piece around itself into a circle and try to fit it into the box. The cord should be slightly compressed. Turn the box upside down to make sure the cord stays inside the box and does not fall off. Next, smear glue over the inside of the box. Compress the cord and fit it inside a second time. There is no need to stitch the coil together. Make a corded pen. Knit your cord a little longer than the pen or pencil you want to use for the craft. Remove the yarn from the spool. Pass your thread into the loops and tighten. Make a knot. On the other side of the cord, slide your pen or pencil in. Add a little glue in order to keep the pen inside the cord from sliding off. “Craftstylish”; Three Fun Spool-Knitting Crafts to Try; Diane Gilleland. The Project Gutenberg eBook; “Spool Knitting”; Mary A. McCormack.